Here is a recording of Hymn No. 22 from the “Hymns of Dawn” to aid God’s people in singing and making melody in their hearts unto God. For this choicest gift from heav’n. Still some new, rich gem appears. “(9) Wherewithal shall a young man cleanse his way? by taking heed thereto according to thy word. (11) Thy word have I hid in mine heart, that I might not sin against thee. (17) Deal bountifully with thy servant, that I may live, and keep thy word. (25) My soul cleaveth unto the dust: quicken thou me according to thy word. (28) My soul melteth for heaviness: strengthen thou me according unto thy word. (38) Stablish thy word unto thy servant, who is devoted to thy fear. (41) Let thy mercies come also unto me, O Lord, even thy salvation, according to thy word. (42) So shall I have wherewith to answer him that reproacheth me: for I trust in thy word. (49) Remember the word unto thy servant, upon which thou hast caused me to hope. (50) This is my comfort in my affliction: for thy word hath quickened me. (58) I intreated thy favour with my whole heart: be merciful unto me according to thy word. (81) My soul fainteth for thy salvation: but I hope in thy word. (103) How sweet are thy words unto my taste! yea, sweeter than honey to my mouth! (104) Through thy precepts I get understanding: therefore I hate every false way. (105) Thy word is a lamp unto my feet, and a light unto my path. (107) I am afflicted very much: quicken me, O Lord, according unto thy word. (114) Thou art my hiding place and my shield: I hope in thy word. (115) Depart from me, ye evildoers: for I will keep the commandments of my God. (116) Uphold me according unto thy word, that I may live: and let me not be ashamed of my hope. (130) The entrance of thy words giveth light; it giveth understanding unto the simple. (140) Thy word is very pure: therefore thy servant loveth it. (154) Plead my cause, and deliver me: quicken me according to thy word. (158) I beheld the transgressors, and was grieved; because they kept not thy word. (160) Thy word is true from the beginning: and every one of thy righteous judgments endureth for ever. (161) Princes have persecuted me without a cause: but my heart standeth in awe of thy word. (162) I rejoice at thy word, as one that findeth great spoil. (163) I hate and abhor lying: but thy law do I love. (164) Seven times a day do I praise thee because of thy righteous judgments. (165) Great peace have they which love thy law: and nothing shall offend them. (169) Let my cry come near before thee, O Lord: give me understanding according to thy word. (170) Let my supplication come before thee: deliver me according to thy word. “(12) Yea, and all that will live godly in Christ Jesus shall suffer persecution. (16) All scripture is given by inspiration of God, and is profitable for doctrine, for reproof, for correction, for instruction in righteousness. (20) for the anger of man does not produce the righteousness of God. (21) Therefore put away all filthiness and rampant wickedness and receive with meekness the implanted word, which is able to save your souls. (22) But be doers of the word, and not hearers only, deceiving yourselves. (23) For if anyone is a hearer of the word and not a doer, he is like a man who looks intently at his natural face in a mirror. (24) For he looks at himself and goes away and at once forgets what he was like. (25) But the one who looks into the perfect law, the law of liberty, and perseveres, being no hearer who forgets but a doer who acts, he will be blessed in his doing. (26) If anyone thinks he is religious and does not bridle his tongue but deceives his heart, this person’s religion is worthless. No other book which the world has ever known has such a history as the Bible. Its origin and authorship, its antiquity, its wonderful preservation in the midst of the unparalleled and continuous opposition which sought to destroy it, as well as its diversity and teaching, make the Bible the most wonderful book in existence. Those who will make a study of the Bible plan will be fully convinced of the conclusive evidence of the credibility of the Sacred Scriptures, which is furnished in the purity, harmony and grandeur of its teachings. Our first definite information with reference to the Sacred Writings is afforded by the direction given to Moses to write the law and history in a book, and put it in the side of the ark for preservation. (See Exod. 17:14; 34:27; Deut. 31:9-26.) This book was left for the guidance of the people. Additions were made to it from time to time by subsequent writers, and in the days of the kings, scribes appear to have been appointed whose business it was to keep a careful record of the important events occurring in Jewish history, which records—Samuel, Kings, Chronicles—were preserved and subsequently incorporated with the Law. The Jewish copyists regarded these documents with great veneration. A very slight error in copying often led them to destroy it and begin anew. Josephus says that through all the ages that had passed none had ventured to add to, take away from, or transpose, aught of the Sacred Writings. One of the strongest evidences of the authenticity of the O.T. Scriptures is found in the fact that the law and the prophets were continually referred to by our Lord and the apostles as authority, and that while the Lord denounced the corruptions of the Jewish Church, and their traditions, by which they made void the Word of God, he did not even intimate any corruption in these Sacred Writings, but commends them, and refers to and quotes them in proof of his claims. In fact, the various parts of the entire book are bound together by the mutual endorsement of the various writers, so that to reject one is to mar the completeness of the whole. Each book bears its own witness and stands on its own evidence of credibility, and yet each book is linked with all the rest, both by their common spirit and harmony and by their mutual endorsement. Mark, for instance, the endorsement of the account of creation in the commandment of the law concerning the Sabbath day.—Exod. 20:11. Also compare Deut. 23:4,5; Joshua 24:9; Micah. 6:5; 2 Pet. 2:15; Jude 11-13; Isa. 28:21; Hab. 3:11; Matt. 12:40. And even at that early date it contained the same books as at present with the exception of the Second Epistle of Peter, the Third Epistle of John, Jude and the Book of Revelation. And these omitted books we know were written about the close of the first century, and probably had not been widely circulated among the Christian congregations at that time. The first five books of the N.T. are historical, and present a clear and connected account of the life, character, circumstances, teachings and doings of Jesus of Nazareth, who claimed to be the Messiah promised in the O.T. Scriptures, and who fully substantiated his claim. The four accounts of the Evangelists, though they differ in phraseology, are in harmony in their statements, some important items being recorded by each which seem to have been overlooked by the others. These Evangelists testified to that of which they had positive knowledge. The Apostle John says: That which we have seen and heard declare we unto you—”that which was from the beginning (the beginning of the Lord’s ministry), which we have heard, which we have seen with our eyes, which we have looked upon, and our hands have handled of the Word of life; for the life was manifested, and we have seen it, and bear witness.” (1 John 1:1-3.) They testify also that they saw Christ after his resurrection. The fifth book [the Book of Acts] presents a valuable account of the doings of the Apostles after their anointing with the Holy Spirit, of the establishment of the Christian Church, and of the first preaching of the good news to the Gentiles. The original copies of both the Old and New Testaments have, of course, long since disappeared, and the oldest manuscript (the Sinaitic) is reckoned to have been written about three centuries after the death of Christ. Those of earlier date were either destroyed in the persecutions under which the church suffered, or were worn out by use. These oldest manuscripts are preserved with great care in the Museums and Libraries of Europe. During the Middle Ages, when ignorance and corruption prevailed and the Bible was hidden in monasteries away from the people, God was still carrying on his work, preserving the Scriptures from destruction even in the midst of Satan’s stronghold, the apostate [R1146] Church of Rome. A favorite occupation of the monks during the Middle Ages was the copying of the manuscripts of the N.T. … Of these manuscripts there are said to be now more than two thousand, of various dates from the fourth to the fifteenth centuries. The quiet seclusion of those monks gave them special opportunities for careful copying, and years were sometimes spent in the copying of a single manuscript. Very early in the Christian Era translations of the New Testament Scriptures were made into several languages, and the different factions that early developed and continued to exist, though they might have been desirous of adding to or taking from the original text in order to give their claims a show of Scriptural support, were watched by each other to see that they did not do so, and had they succeeded in corrupting the text in one language, another translation would make it manifest. Even the Douay translation, in use in the Romish church, is in most respects substantially the same as the King James translation. The fact that during the “dark ages” the Scriptures were practically cast aside, being supplanted by the decrees of popes and councils, so that its teachings had no influence upon the masses of the people who did not have copies in their possession—nor could they have read them if they had them—doubtless made unnecessary the serious alteration of the text, at a time when bold, bad men had abundant power to do so. For men who would plot treason, incite to wars and commit murders for the advancement of the papal hierarchy, as we know was done, would have been bold enough for anything. Thus the depth of ignorance in the dark ages served to protect and keep pure God’s Word, so that its clear light has shone specially at the two ends of the Gospel age. (1 Cor. 10:11.) The few interpolations which were dared, in support of the false claims of Papacy, were made just as the gloom of the “dark ages” was closing in upon mankind, and are now made glaringly manifest, from their lack of harmony with the context, their antagonism with other scriptures and from their absence in the oldest and most complete and reliable manuscripts. As to the relative values of ancient manuscripts, we quote the following comments from the pen of that eminent German scholar, Constantine Tischendorf, who spent many years of his life in diligently searching out and comparing the various ancient manuscripts and translations of the Scriptures in many languages, and who has furnished to the church the results of his investigation in a careful exhibit of the various departures of the English Authorized Version of the New Testament from the three oldest and most important manuscripts. “As early as the reign of Elizabeth the English nation possessed an authorized translation, executed by the Bishops under the guidance of Archbishop Parker; and this, half a century later, in the year 1611, was revised at the command of James the First by a body of learned divines, and became the present ‘Authorized Version.’ Founded as it was on the Greek text at that time accepted by Protestant theologians, and translated with scholarship and conscientious care, this version of the New Testament has deservedly become an object of great reverence, and a truly national treasure to the English Church. The German Church alone possesses in Luther’s New Testament a treasure of similar value…. “The Authorized Version, like Luther’s, was made from a Greek text which Erasmus in 1516, and Robert Stephens in 1550, had formed from manuscripts of later date than the tenth century. Whether those manuscripts were thoroughly trustworthy—in other words, whether they exhibited the Apostolic original as perfectly as possible—has long been matter of diligent and learned investigation. Since the sixteenth century Greek manuscripts have been discovered of far greater antiquity than those of Erasmus and Stephens; as well as others in Latin, Syriac, Coptic, and Gothic, into which languages the sacred text was translated between the second and fourth centuries; while in the works of the Fathers, from the second century downwards, many quotations from the New Testament have been found and compared….One thing is agreed upon by the majority of those who understand the subject, namely, that the oldest copies approach the original text more nearly than the later ones. “Providence has ordained for the New Testament more sources of the greatest antiquity than are possessed by all the old Greek literature put together. And of these, two manuscripts have for long been especially esteemed by Christian scholars, since, in addition to their great antiquity, they contain very nearly the whole of both the Old and New Testaments. Of these two, one is deposited in the Vatican, and the other in the British Museum. Within the last ten years a third has been added to the number, which was found at Mount Sinai, and is now at St. Petersburg. These three manuscripts undoubtedly stand at the head of all the ancient copies of the New Testament, and it is by their standard that both the early editions of the Greek text and the modern versions are to be compared and corrected. “The effect of comparing the common English text with the most ancient authorities will be as often to disclose agreement as disagreement. True, the three great manuscripts alluded to differ from each other both in age and authority, and no one of them can be said to stand so high that its sole verdict is sufficient to silence all contradiction. But to treat such ancient authorities with neglect would be either unwarrantable arrogance or culpable negligence; and it would be indeed a misunderstanding of the dealings of Providence, if after these documents had [R1147] been preserved through all the dangers of fourteen or fifteen centuries, and delivered safe into our hands, we were not to receive them with thankfulness as the most valuable instruments for the elucidation of truth. “… To us the most reverential course appears to be, to accept nothing as the Word of God which is not proved to be so by the evidence of the oldest, and therefore most certain, witnesses that he has put into our hands. With this in view, and with this intention, the writer has occupied himself for thirty years past, in searching not only the Libraries of Europe, but the obscurest convents of the East, both in Africa and Asia, for the most ancient manuscript, of the Bible; and has done all in his power to collect the most important of such documents, to arrange them and to publish them for the benefit both of the present age and of posterity, so as to settle the original text of the sacred writers on the basis of the most careful investigation. “The first of these great manuscripts already referred to which came into possession of Europe was the Vatican Codex. Whence it was acquired by the Vatican Library is not known; but it appears in the first catalogue of that collection which dates from the year 1475. The manuscript embraces both the Old and New Testaments. Of the later it contains the four Gospels, the Acts, the seven Catholic Epistles, nine of the Pauline Epistles, and the Epistle to the Hebrews as far as 9:14, from which verse to the end of the New Testament it is deficient; so that not only the last chapters of Hebrews, but the Epistle to Timothy, Titus and Philemon, as well as the Revelation, are missing. The peculiarities of the writing, the arrangement of the manuscript, and the character of the text—especially certain very remarkable readings—all combine to place the execution of the Codex in the fourth century, possibly about the middle of it. “The Alexandrine Codex was presented to King Charles the First in 1628 by Cyril Lucar, Patriarch of Constantinople, who had himself brought it from Alexandria, of which place he was formerly Patriarch, and whence it derives its name. It contains both the Old and New Testaments. Of the New the following passages are wanting:—Matt. 1:1 to 25:6; John 6:50 to 8:52; 2 Cor. 4:13 to 12:6. …It would appear to have been written about the middle of the fifth century. “The Sinaitic Codex I was myself so happy as to discover in 1844 and 1859, at the convent of St. Catherine, on Mount Sinai, in the later of which years I brought it to Russia to the Emperor Alexander the Second, at whose instance my second journey to the East was undertaken. It contains both Old and New Testaments—the latter perfect without the loss of a single leaf….All the considerations which tend to fix the date of manuscripts lead to the conclusion that the Sinaitic Codex belongs to the middle of the fourth century. Indeed, the evidence is clearer in this case than in that of the Vatican Codex; and it is not improbable (which cannot be the case with the Vatican MS.) that it is one of the fifty copies which the Emperor Constantine in the year 331 directed to be made for Byzantium, under the care of Eusebius of Caesarea. In this case it is a natural inference that it was sent from Byzantium to the monks of St. Catherine by the Emperor Justinian, the founder of the convent. The entire Codex was published by its discoverer, under the orders of the Emperor of Russia, in 1862, with the most scrupulous exactness, and in a truly magnificent shape, and the New Testament portion was issued in a portable form in 1863 and 1865. “These considerations seem to show that the first place among the three great manuscripts, both for age and extent, is held by the Sinaitic Codex, the second by the Vatican, and the third by the Alexandrine. And this order is completely confirmed by the text they exhibit, which is not merely that which was accepted in the East at the time they were copied; but, having been written by Alexandrine copyists who knew but little of Greek, and therefore had no temptation to make alterations, they remain in a high degree faithful to the text which was accepted through a large portion of Christendom in the third and second centuries. The proof of this is their agreement with the most ancient translations—namely, the so-called Italic, made in the second century in proconsular Africa; the Syriac Gospels of the same date, now transferred from the convents of the Nitrian desert to the British Museum; and the Coptic version of the third century. It is confirmed also by their agreement with the oldest of the Fathers, such as Irenaeus, Tertullian, Clement and Origen. St. Catherine’s Monastry, Mount Sinai – Here Constantine Tischendorf discovered the Sinaitic Codex (one of the original New and Old Testament manuscripts) in 1844 and 1859. “These remarks apply to the Sinaitic Codex—which is remarkably close in its agreement to the ‘Italic’ version—more than they do to the Vatican MS., and still more so than the Alexandrine, which, however, is of far more value in the Acts, Epistles and Apocalypse than it is in the Gospels [R1147]…. Another remarkable means for preserving and verifying the New Testament writings is their copious quotation in other writings. Origen — who wrote in the early part of the third century, quotes 5745 passages from all the books in the New Testament; Tertullian — (A.D. 200), makes more than 3000 quotations from the N.T. books; Clement — (A.D. 194), quotes 380 passages; Irenaeus — (A.D. 178), quotes 767 passages; Polycarp — who was martyred A.D. 165, after serving Christ 86 years, quoted 36 passages in a single epistle; Justin Martyr — (A.D. 140), also quotes from the N.T. These were all Christian writers; and in addition to these, the Scriptures were largely quoted by heathen and infidel writers, among them Celsus (A.D. 150) and Porphyry (A.D. 304). Indeed the entire New Testament, with the exception of about a dozen verses, has been found scattered as quotations through various writings that are still extant. And if every copy of the N.T. had been destroyed by its enemies, the book could have been reproduced from these quotations contained in the writings of the early Christians and their enemies. While the means for the preservation of the Scriptures have been thus remarkably complete, and in view of the unparalleled opposition with which they have met give evidence of Divine care in their preservation, the means for their verification, and for arriving at an understanding of them in God’s due time, are found to be none the less remarkable. No other book in the world has ever had such attention as this book. The labor that has been spent in the preparation of complete concordances, indexes, various translations, etc., has been enormous; and the results to students of the Bible are of incalculable value. 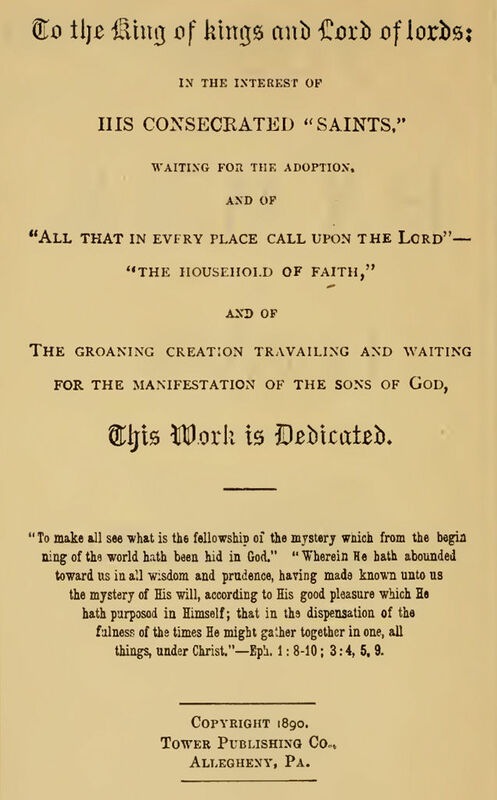 And while we recognize the providence of God in all this, we should and do appreciate these labors of his children and their great service to us, though we utterly repudiate, as useless, the labor that has been spent on many so-called theological writings, which are nothing more than miserable efforts to support the vain traditions of men, the accumulated monstrous volumes of which would indeed form a monument of human folly. Just in “The Time of the End,” when the prophet (Dan. 12:9,10) declares that “the wise (the meek and faithful children of God) shall understand,” we find these wonderful aids coming forward to our assistance. And parallel with these has happened the general spread of intelligence and education and the placing of the Bible in the hands of the people, thus enabling them to use the helps provided. The Bible claims to be a book written under divine inspiration. The word inspire signifies to breathe in, to infuse, to fill, to inhale—as to inspire the lungs with air. (See Webster’s Dictionary.) Hence, when it is said that certain scriptures, or writings of godly men, were given by inspiration of God (2 Tim. 3:16), it signifies that those men were in some way, whether through miraculous or natural means, inspired by, or brought under the influence of God; so as to be used by him in speaking or writing such words as he wished to have expressed. The prophets and apostles all claimed such inspiration. Peter says, “The prophecy came not in old time by the will of man, but holy men of God spake as they were moved by the holy Spirit.”—2 Pet. 1:21. Through Moses we have the law of God and the only existing credible history of mankind from the creation of Adam down to his own time, covering a period of about 2500 years. While Moses and the other Bible writers were holy men, inspired with pure motives and holy zeal, and while personal pride, ambition, etc., were no part of their spirit, we learn that Moses was inspired with the knowledge of God’s law, both in its great principles and also in the minutiae of its typical ceremonials, by direct revelation from God at Mount Sinai, and of some points of duty at the burning bush at Horeb, etc. As for his historical writings, Moses was evidently guided of God in the collation and presentation in its present complete and connected form of the history of the world down to his day, which was really in great part the history of his own family back to Adam with an account of the creation doubtless given by God to Adam while he was yet in fellowship in Eden. Nor does a correct handing down of family information, covering a period of over 2300 years, seem impossible, or liable, as it would now be, to have become polluted; for, aside from the fact that it was handed down through the God-fearing family line of Seth, it should be remembered that at that time the bodies, brains and memories of men were not so weak as they are now, and as they have been since the flood; and finally, because the long lives of two men link Adam with the family of Abraham, the family of covenant favor,—with Isaac, the typical seed of promise. These two men were Methuselah and Shem. Methuselah was over 200 years old when Adam died, and had abundant opportunity, therefore, for information at first hands; and Shem, the son of Noah, lived contemporaneously with Methuselah for 98 years, and with Isaac for 50 years. Thus, these two living, God-fearing men acted as God’s historians to communicate his revelations and dealings to the family in whom centered the promises, of which Moses was one of the prospective heirs. In addition to these facts, we have the statement of Josephus that Methuselah, Noah and Shem, the year before the flood, inscribed the history and discoveries of the world on two monuments of stone and brick which were still standing in Moses’ time. The Apostle Peter tells us that the prophets of old time often did not understand their own utterances, as they themselves also acknowledge (1 Pet. 1:12; Dan. 12:4,8-10); and we should remember that the twelve apostles (Paul taking the place of Judas—Gal. 1:17; 1 Tim. 2:7) not only filled the office of apostles… they also, especially Peter and Paul and John, filled the office of prophets, and were not only given the spirit of wisdom and understanding by which they were enabled to understand and explain the previously dark prophecies, but in addition to this we believe that they were under the guidance and supervision of the Lord to such an extent that their references to things future from their day, things therefore not then due to be fully understood, were guided, so as to be true to an extent far beyond their comprehension, and such consequently were as really prophetic as the utterances of the old-time prophets. Illustrations of this are to be found in the Revelations of the Apostle John, in Peter’s symbolic description of the Day of the Lord (2 Pet. 3:10-13), and in numerous references to the same period by Paul also, among which were some things hard to be understood even by Peter (2 Pet. 3:16) and only partially then by Paul himself. The latter, however, was permitted to see future things more clearly than others of his time, and to that end he was given special visions and revelations which he was not allowed to make known to others (2 Cor. 12:1-4), but which, nevertheless, influenced and colored his subsequent teachings and his epistles. And these very items which Peter thought strange of, and called “hard to be understood,” are the very items which now, in God’s due time, for which they were intended, so grandly illuminate not only Peter’s prophecies and John’s Revelation, but the entire word and plan of God,—that the man of God may be thoroughly furnished.—2 Tim. 3:16,17. … There were, even in the days of the apostles, ambitious men who taught another gospel and claimed for themselves the honors of special revelations and authority as apostles and teachers of no less authority than the twelve apostles. And ambitious men of the same sort have from time to time since arisen—Emanuel Swedenborg and many less able and less notable—whose claims, if conceded, would not only place them in rank far above Paul, the prince of the apostles, but whose teachings would tend to discredit entirely, as “old wives’ fables,” the whole story of redemption and remission of sins through the blood of the cross. These would-be apostles, boastful, heady, high-minded, have “another gospel,” a perversion of the gospel of Christ; and above all they despise and seek to cast discredit upon the words of Paul who so clearly, forcibly and logically lifts up the standard of faith and points to the cross—the ransom—as the sure foundation, and who so clearly showed that pseudo -apostles, false apostles, would arise and deceive many. It not only required an inspiration to write God’s plan, but it also requires an inspiration of the Almighty to give an understanding of that revelation; yet this inspiration is of a different sort. When any one has realized himself a sinner, weak, imperfect and condemned, and has accepted of Christ as his Redeemer, and full of love and appreciation has consecrated his heart (his mind, his will) to the Lord, to henceforth please not himself but his Redeemer,—God has arranged that such a consecration of the natural mind brings a new mind. The spirit of the truth inspires and controls to a greater or lesser extent … their words and thoughts, and even their very looks. Yet such an inspiration, common to all the saints, in proportion to their development, should be critically distinguished from the special and peculiarly guided and guarded inspiration of the twelve apostles, whom God specially appointed to be the teachers of the church, and who have no successors in this office. Only twelve were “chosen,” and when one of these, Judas, fell from his honorable office, the Lord in due time appointed Paul to the place; and he not only has never recognized others, but clearly indicates that he never will recognize others in that office.—Rev. 21:14. With the death of the Apostles the canon of Scripture closed, because God had there given a full and complete revelation of his plan for man’s salvation; though some of it was in a condensed form which has since expanded and is expanding and unfolding and will continue to expand and shine more and more until the perfect day—the Millennial Day—has been fully ushered in. Paul expresses this thought clearly when he declares that the Holy Scriptures are able to make wise unto salvation, and that they are sufficient. As we consider, then, the completeness, harmony, purity and grandeur of the Bible, its age and wonderful preservation through the wreck and storms of [nearly] six thousand years, it must be admitted to be a most wonderful book; and those who have learned to read it understandingly, who see in it the great plan of the ages, cannot doubt that God was its inspiring Author, as well as its Preserver. Its only parallel is the book of nature by the same great Author. Posted on July 31, 2018 August 24, 2018 by Bible Students DailyPosted in Hymns of DawnTagged 1 Chron. 27"32, 1 Kings 14:21, 1 Kings 18, 1 Sam. 10:25, 100 ad, 100ad, 1475, 1611, 1628, 1844, 1859, 2 Chron. 33, 2 Cor. 12:6, 2 Cor. 4:13, 2 tim, 2 Tim. 3:15, 2043, 331ad, a beautiful temple, accept Christ, Adam, alexandrian, Aramaic, Authorized version, Bible, bible authenticity, bible credibility, bible translations, blessed bible, Br. David Rice, Br. George Tabac, Byzantium, Celsus, Charles Taze Russell, codex sinaticus, condemned, consecrated, Constantine Tischendorf, Cyril Lucar, dark ages, dawn bible students association, Deut. 31, earliest bible, earliest copy of the bible, earliest copy of the new testament, earliest new testament, Emanuel Swedenborg, Emperor Alexander the second, Emperor Justinian, Erasmus, Eusebius of Caesarea, exod 17, Exod. 14, Ezra, from God's standpoint, how can your eyes of understanding be opened, how did the bible survive, how many new testament original mauscripts exist, hymn 22, Hymns of Dawn, imperfect, Irenaeus, Isa. 30:8, Isaiah 30:8, James the first, Jer. 30, Jer. 45, Jeremiah 36, Jerm. 51, John 6:50, Josephus, Josh. 1:8, Justin Martyr, King Charles the first, language, Mat . 1:1, Methuselah, Mount Sinai, Nehemiah 8, new mind in christ, opens the eyes of the understanding, Origen, original Bible manuscripts, original watchtower, papal hierarchy, Polycarp, Porphyry, R60, reliability of present bible translations, reprint 60, reprint no. 60, Robert Stephens, Shem, sinner, St. Catherine monastry, Syria, Syriac language, temple, Tertullian, the Alexandrian Codex, the Apostles, the authorship and credibility of the Bible, the bible during the dark ages, the prophets of old, Tischendorf, Vatican Codex, vaticanus, Watch Tower, Watch Tower and Tract Society, Watchtower, weak, when was the sinaitic codex discovered, who has a new mind in christ, who wrote the Bible, Zion Watch Tower. Dear brethren, more grace and peace. Thank you very much for sharing. Warmest greetings and good wishes for your good health. Courage! Keep up the good fight. Dear Brother Alex – Greetings IN our BELOVED – Christ Jesus, through whom we can BE HIDDEN IN where inside the Holy of Holies we can, by FAITH, sit down with him in, and his banner of love is over us! Thank you for your unceasing words of edification IN CHRIST. “(20) May the GOD OF PEACE who brought again from the dead our Lord Jesus, the great shepherd of the sheep, by the blood of the eternal covenant, (21) equip you with everything good that you may do His will, working in us that which is pleasing in His sight, through Jesus Christ, to whom be glory forever and ever. Amen” (Hebrews 13:20-21, ESV). Greet all GOD’s people. We send you and our Brethren in Christ there greetings. “Grace be with you all” (Hebrews 13:25).